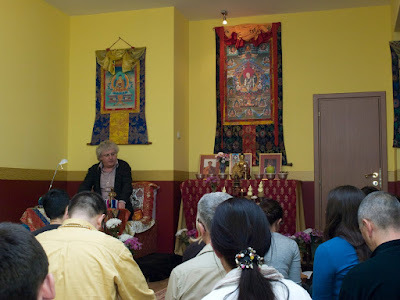 On Wednesday 17 February Lama Jampa Thaye gave a public talk in the Czech cultural centre in Sofia as part of his visit to Bulgaria to open the new Dechen Sakya centre, Sakya Choling. Lama Jampa outlined the foundations of the Buddha’s teachings and their relevance to the modern world. There was also a short opportunity for people to ask questions after the talk. Lama Jampa’s visit concluded with a teaching and an initiation on the Saturday, the first public events at Sakya Choling. In the morning Lama Jampa taught Sakya Pandita’s brief commentary on Parting from the Four Attachments. In the afternoon he bestowed the initiation of White Mahakala from the Shangpa Kagyu tradition. This deity is a form of Chenrezik and one of the chief wealth and protection deities of Vajrayana Buddhism. Both the teaching and the initiation were well attended by local sangha, newcomers and people from other sanghas in Bulgaria. At the end of the teachings Lama Jampa announced that he would visit Bulgaria again in July for a more substantial period of time.